Some of Millbrae's tickets can be ignored. If your "ticket" does not have the San Mateo County Superior Court's name and address on it, it is a fake ticket, what I call a "Snitch Ticket." For more details, see the Snitch Ticket section at the top of the Your Ticket page. If you have a ticket from Millbrae be sure to contact me, and also read Defect # 8 (on the Home page) and the "San Mateo County Information," which is Docs Set # 5 on the San Mateo Documents page. State Senator Jerry Hill: In early 2018 Sen. Hill introduced SB 1132 which, had it passed, would have reduced the fine for a rolling right violation. Sen. Hill hosts frequent public events around his district, which includes the red light camera cities of Millbrae, San Mateo and Menlo Park. Here is info about the next event. When: Friday Feb. 22, 2019, 9:00 am to 10:00 am..
"Please join me for a cup of coffee and conversation at 'Java with Jerry.' Bring your ideas, questions and concerns about legislative issues affecting the community. No RSVP or appointment necessary. Coffee will be provided at no taxpayer expense." For questions, Hill's phone is (650) 212-3313. For more information about participating in one of Sen. Hill's events, or to get on his mailing list to be notified of future events, phone his office at (650) 212-3313. *Millbrae does not have its own police department. The City has a contract under which it pays the City of San Mateo to process its red light camera tickets (see Set # 4, below, for link to copy of that contract); Millbrae contracts with the San Mateo County Sheriff for the remainder of its police services. Do you live in the South end of Alameda County or the North end of Santa Clara County - State Sen. Ellen Corbett's former District? who will be running for re-election in 2018 and 2022. Send him back home to his bankruptcy law practice. As of 2018 he is in the State Legislature in Sacramento and was a co-author of SB-1 which raised gas tax and car registration fees beginning Nov. 2017 and which could be repealed by Prop. 6 on the Nov. 2018 ballot. 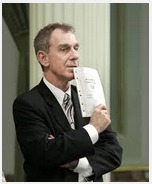 In 2013 he was the author of AB-666 which - had it passed - would have increased the number of red light camera tickets. Before reaching the Legislature he was a member of the Fremont City Council, and during his time on the council he approved two extensions of Fremont's contract with RedFlex: He was the maker of the 2005 motion to extend the contract to 2010, and in 2010 he made the motion to extend the contract to June 2017. Totals are as provided by the City, except for Jul. 2009 to Mar. 2010, which are hand totals by highwayrobbery.net, and those marked . These annual totals and annual projections are by highwayrobbery.net. res in black type are what ATS calls Citations Issued, and may represent the sum of genuine citations issued (those filed with the court) plus any Nominations mailed (not filed with the court, a.k.a. Snitch Tickets). The lanes are numbered from the center of the street (most often a left turn lane), out to the curb (most often a right turn lane). The figures in this row are totals for the 30 months 10-1-06 to 3-31-09, from a table provided by the City. The report for this month was generated less than ten days after the end of the month which left a number of Violation Events not yet fully processed ("still in workflow"). Thus it is likely that more citations will be issued, with the maximum being 23 additional citations. The report for this month was generated a few days before the end of the month. Further, there is a (approx.) five day lag in the approval of citations. As a result, the Citations Issued figures have not been posted to the table above. See Big Spike in Ticketing, below. This camera operates under an Encroachment Permit issued by the State. See Set # 3, below. In June 2011 a right turn arrow was installed at Nbd Rollins at Millbrae. The camera-by-camera figures posted above for 2010 and before are the totals for all lanes enforced by the camera. If there is sufficient public interest, the lane-by-lane figures will be requested and posted. In Nov. 2015 CalTrans added 0.4 sec. to the length of the yellows for the photo-enforced movements at these intersections. See Set # 8, below. Until (calendar year) 2016 Millbrae did not provide the annual report required by CVC 21455.5(i), so highwayrobbery.net estimated the number of straight thru, right, and left turn tickets. The movements designated in the row at the bottom of the table above are a generalization used to make the 2013, 2014 and 2015 estimates. The official annual reports become available by the Fall of the following year. See Set # 2, below. ATS' 3-31-18 invoice to the City included a credit for M107 being out of service from 3-1-18 to 3-14-18. A doubling in May 2014 and the jump in June 2015 were subjects of Vic Lee reports on KGO-TV on Aug. 5, 2014 and July 28, 2015, and a Stanley Roberts report on KRON-TV, on July 30, 2015. "While the number of citations issued were reduced in July  as we completed our due diligence into the increase, it is anticipated that these numbers will return to the levels of May and June 2014." Next, March 2016 was the highest ever, by far - until July 2016. Why are the Spikes Happening? "Lee attributed the jump in tickets to increased economic activity in Millbrae, as officials have dedicated effort in recent months to improving the city’s downtown." Millbrae Councilmember Wayne Lee, in 11-21-16 Daily Journal article. The City's efforts to improve the downtown are to be commended, but the sudden doubling of flashes (the red numbers in the table above) seen beginning in June 2016 at the 101 offramp - and then the sudden drop of ticketing (the black numbers) beginning in April 2017 - both look like the result of human intervention ("endogenous") and probably are not due to changes in the traffic volume associated with local economic activity. Aug. 2018 ticketing by the two cameras at the base of the 101 offramp was the highest in two years. If you have a Millbrae ticket, please contact me. And - since this camera operates under a State of California Encroachment Permit - be sure to contact your state legislators in Sacramento (see Set # 3, below). If you wish to contact the city council - or other Bay Area authorities such as the BART board or the SFO Commission, see the contact info near the top of this page. Per the City's annual report for 2016, 81% of the City's tickets were for right turns. Claimed by Millbrae Councilmember Wayne Lee, in 11-21-16 Daily Journal article. The City provided this report of ticket revenue it received from the court. The figures are "gross," before any City payments to the camera company. Highwayrobbery.net obtained the following monthly figures for 2011 to 2015 directly from the court (in thousands). sent to the City, go to Docs Set # 5 on the San Mateo Docs page. Millbrae's 2015-2018 revenue figures are displayed in the rightmost column in Set # 1, above. As of late 2015 Millbrae was paying ATS $26,975 per month for the cameras, and the City was paying the City of San Mateo's police department, which operates the program on behalf of Millbrae, a fee of $5225 per month, for a total of $32,200 per month. The fees paid to ATS and the SMPD cover all of the routine work associated with the camera program, although Millbrae remains responsible for responding to public records requests and for providing legal representation when tickets are challenged in court. Part of the corporate motto of a large tech corporation headquartered near Millbrae. Encroachment Permits - The City's Achilles' Heel? In June 2015 highwayrobbery.net sent CalTrans a letter suggesting that the accident records did not justify the issuance of the Permits. On July 7, 2016 CalTrans asked the City to provide more information, and set a 45-day deadline. The revised study included this colorful graph. 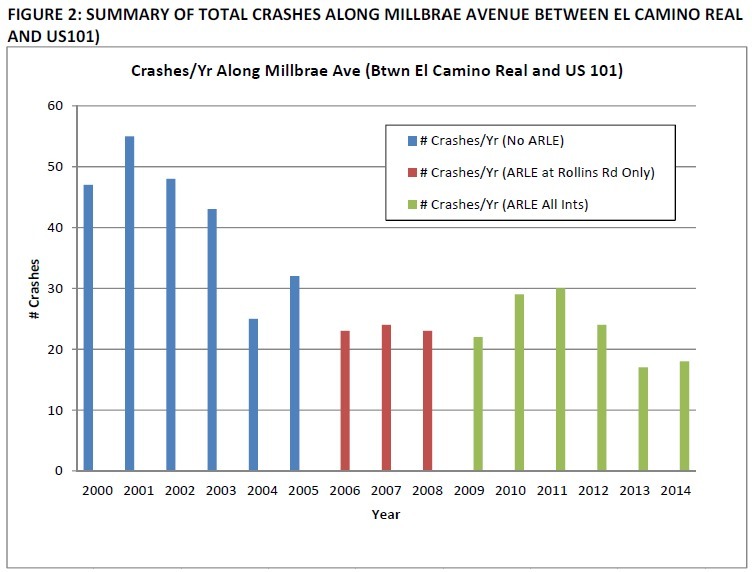 "The overall number of crashes per year are generally lower with the ARLE program in operation...."
of the prolific cameras at El Camino/Millbrae and 101/Millbrae, crashes rose instead of declining. If you feel that your Millbrae ticket was unfair, or a trap, or that the rate of accidents wasn't and/or isn't high enough to justify the heavy enforcement, please consider asking your representatives in Sacramento (assemblymember and state senator) to ask CalTrans to refuse to grant the annual renewal of Millbrae's Encroachment Permits. In Jan. 2018 CalTrans extended both of Millbrae's permits to Feb. 1, 2019. Some other cities operate cameras under Encroachment Permits. For more information about those cities and about CalTrans' criteria for the issuance of an Encroachment Permit, see the CalTrans section on the Links page. On March 14, 2006 the city council approved the implementation of a red light camera system, and also the police department's selection of American Traffic Solutions ("ATS") to be the supplier of the system. The staff report did not reveal why there was no competitive bidding. "On June 13, the City Council again will approve a proposal to install red light traffic cameras at Rollins Road and Millbrae Avenue, which could generate additional revenue for the City (but more importantly improve traffic safety)." Millbrae's system began issuing tickets on Oct. 18, 2006. The 2006 contract, with an initial term of five years, includes two two-year extensions which were to occur automatically unless the City provided ATS with 120 days prior notice that it wished not to extend. The City took no action before the Oct. 2011 end of the five year contract term, thus allowed the contract to automatically extend to Oct. 2013. In an after-the-fact June 2012 letter to ATS the City confirmed the extension and asked ATS to remove camera M105. Invoices and check stubs received from the City in June 2013 revealed that Millbrae continued to pay $5395 per camera per month, way too much for equipment averaging five years old. In Feb. and June 2013 highwayrobbery.net wrote to the city council, suggesting that they negotiate for a better price. In Oct. 2013 the City again allowed the contract to automatically extend for another two years, to Oct. 2015, without obtaining a better price; invoices received in Feb. 2014 (and again in Feb. 2015) showed that after the second extension, Millbrae continued to pay $5395 for equipment having an average age of seven years (as of Oct. 2014, the midway point of the extension). In March 2014 the City of Elk Grove, California approved a new contract which specified the following schedule of rents for their five cameras. Millbrae will pay 112% too much (more than double the Elk Grove price schedule) over the two years of the 2013-2015 extension, $342,696 extra. To cover that extra rent, the City will need to issue an extra 3427 tickets (assuming that the City receives an average of $100 for each ticket issued). And there was no way out. Millbrae's 2013-2015 contract did not include an escape clause (Termination for Convenience) - something commonly found in other cities' contracts - so the City was locked in until Oct. 2015 and could not cancel or get a better price. Go to FAQ # 17 for more information about other cities' contracts, and to see how much they pay. Millbrae does not process its red light camera tickets. Nor does the sheriff. The City has a contract under which it pays the City of San Mateo and its police department a flat fee to process the tickets, appear in court, and run all other aspects of the program. In a late 2016 amendment to the contract, Millbrae agreed to increase the fee it pays to San Mateo to $18,550, more than triple the previous $5225. "Really, I cannot say for certain if the red light traffic cameras make a difference or not." And then the council voted 5 - 0 to accept a contract for three years plus a "potential" two more years "option." But it's not clear that in the end the council got what they voted for. 1. In two places the staff report said, "... a three year term... with a potential two year further extension if desired by the City." 2. The resolution said, " ... the option to extend the agreement for an additional two years." "TERM: This agreement shall commence upon the Effective Date and shall continue for a term of three years. This agreement will automatically extend for a consecutive two year term. However, Customer or ATS may terminate this agreement at the expiration of any term by providing written notice of its intent not to extend the agreement one hundred twenty days prior to the expiration of the then-current term." Opinion: A councilmember - even one who loves cameras - should have been upset to find out that the contract was worded to make the extra two years automatic, after he or she voted to approve a staff report which said that the extra two years would be "potential" or an "option." Under the new contract Millbrae will pay $5395 for each camera each month during the first twelve months of the three years, and then $4195 during the second and third years, for a total payout of $827,100. But at Elk Grove prices (see Elk Grove table, above) Millbrae would pay only $376,704 over the three years, less than half of what it has agreed to pay. To make that extra $450,396, the City will need to issue 4504 extra tickets over the three years (assuming that the City's share from each paid ticket is $150, and that 2/3 of the tickets issued are paid). The City is stuck with those prices - the new contract has been signed by all parties, and it still does not contain an escape clause. As a result, the city council cannot shut the cameras off without breaching the contract. Fortunately for the motoring public, CalTrans has the power to shut down two of the cameras, M106 and M107, by refusing to renew the encroachment permits for those cameras. CalTrans could make a decision about the renewal as soon as the middle of December 2018, so NOW is the time to act. See Set # 3, above. August 2018: Did the Council Allow the Contract to Auto Renew? The council needed to act before Aug. 9, 2018 if it wished to avoid automatic renewal for two more years. Opinion: Extensions should never be automatic - this is not a cable TV contract! Extensions should occur only after a thorough review of safety, by the council, just before the proposed extension would begin. There is also the issue of the price. During the potential two year extension the City will pay an extra $311,400, compared to Elk Grove prices. To make that extra money the City will need to issue 3114 extra tickets during the two years. And then there is the issue of the contract not including an escape clause. This list of contracts and amendments was up-to-date as of June 12, 2018. In July 2014 I asked the City for the guidelines required by CVC 21455.5(c)(1) and the annual report required by CVC 21455.5(i). They provided only the guidelines, which were only one page. In Feb. 2015 the City provided guidelines and business rules. ATS' construction work in the City was the subject of a Prevailing Wage lawsuit. Signal Timing - Were the Yellows Too Short? Internal correspondence, received from CalTrans in Jan. 2016, revealed that they lengthened the yellows. More internal correspondence, received from CalTrans in Apr. 2016, provides more details about the lengthening of the yellows. Received Dec. 2015, from City, along with note from city clerk: "No modifications [of the chart] since 2013." Look in Countywide Info on the San Mateo Docs page for info about the judges, the court, and the Grand Jury. There may be some more Millbrae information posted in the next few weeks. Mark your calendar to remind you to come back here and look!